The confederate jasmine is blooming on my arbors and their fragrance is intoxicating. The weather the last two weeks has been extremely pleasant and porch sitting is my favorite thing to do. I daydream and analyze my garden and watch the birds. They are amazing and I have so many questions about their habits. Decided finally to look up some things in my bird books and then pulled out several gardening books. I have so many gardening books and I spent the afternoon looking at these and more daydreaming. One thing lead to another and I started thinking about the flowers on my grandmother's quilt and surrounding myself with pretty things I was thinking about. A gardener should keep records and put plans on paper. I have a few times but my plans are mostly in my head. Making pictures and having them to refer to on my computer jogs my memory and my pictures are my records. Love the digital age. As I have said before if you would read the books you have you would learn so many things. On days like today I wish for friends sitting here discussing landscaping and bird habits with me. Do you spend as much time as I do thinking about what you should do next? The quilt I am using as a tablecloth was made for me by my grandmother when I was a child. The squares are hand embroidered. When my grandmother did the embroidery and piece work she no longer was able to do quilting. The quilt pieces were in a cedar chest for years. After I married I had someone quilt the coverlet and used it on my daughter's bed for a number of years. Do any of you remember a newspaper magazine called The Grit? I believe my grandmother ordered the pattern for this quilt top from that magazine. She made my sister the same quilt top with pink and blue squares. More bird watching but this hummingbird is hard to photograph for a novice photographer like me. Isn't this the sweetest thing? I couldn't believe I was able to capture it. Are they kissing? Feeding his mate? Bird watching and garden planning are fun. My hydrangeas are budding and a few are opening. Gardenias have swollen buds. This has been a fun afternoon to share with you. Linking to Seasonal Sundays, Inspire me Tuesday and Wow Us Wednesday. OH BONNIE! Your garden is enchanting! LOOK AT Mr. and Mrs. "C" kissing! I would like to think they ARE kissing! It is a pleasure to meet you and see you came by today AND left a comment; that is something many people don't do, but thank you so I can come back here to see your magical world! OH! I and I see that you find it very important to have binoculars on hand! I have a pair near my French doors overlooking the garden so I don't miss a beat! 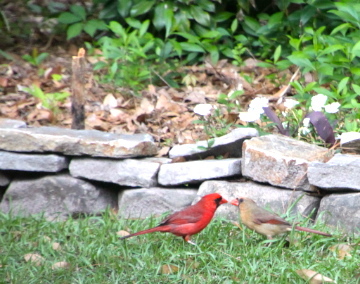 The cardinals are feeding each other, I bet. I've watched them at our feeders and I've seen them doing that. Isn't it sweet? Lovely! I so judge a blog by my first peek at it. As soon as your page opened, I was in love. 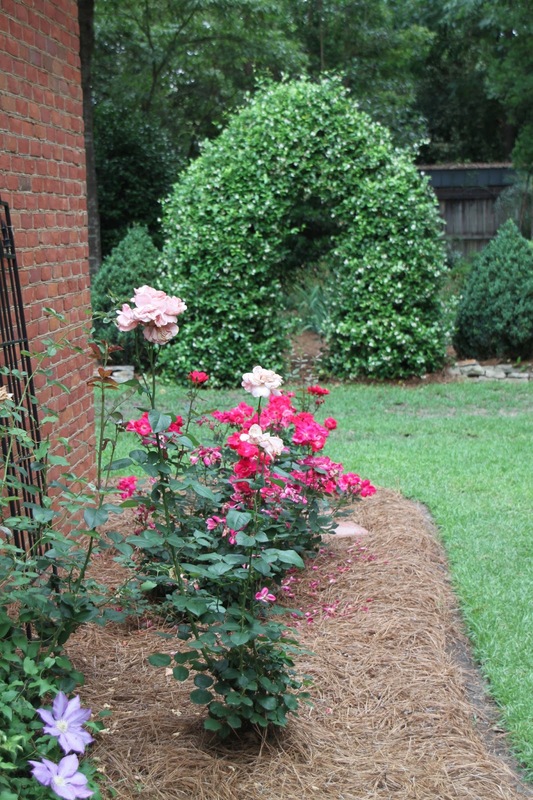 Your header is stunning, and this gardening post was so touching! I am an avid gardener, and feel I have found a kindred spirit! Your confederate jasmine is stunning on the arbor. I am training my to run up the fence, and yes the fragrance is intoxicating! I love how you use your quilt as a tablecloth. Thanks for the garden tour. I wish I had planned more for my beds. Happy Spring. Like you, I have a gazillion garden books. But it seems I never actually get around to reading them, I just devour the pictures... much more fun. If I actually read them, I might be a Master Gardener by now. That is a most impressive jasmine! I planted one this Spring, But it will be a wee tike for quite awhile. One can never have enough gardening books. Love your cloche. The confederate jasmine is absolutely gorgeous on that arbor. I bet it smells divine. Bonnie, I love this post. and your basil and especially the maidenhair fern..so pretty on your quilt tablecloth..I love to do just what you were doing..grab a stack of gardening books and go to my deck and read and dream and plan....kinda reminds me of birds of a feather flock together...happy gardening my friend.. This is such a pretty post, Bonnie, and I think it shows us so much about your personality and your interests in life. The quilt is just beautiful, and what a precious treasure and keepsake! I have a quilt with Dutch dolls on it that my paternal grandmother had someone make for me as a graduation gift. It's so heavy, it's incredibly warm. My sister got one too, of course. Grandparents are really special, aren't they? Holy mackerel!!! Look at the way that arbor is teeming with foliage and flowers!!! It's so pretty! I wish I had an arbor or two in our yard!!!! It's so sweet that you are using and able to admire on a daily basis the quilt your Grandmother made for you. I think it's doubly sweet that you had the project completed later in life! Your Grandmother would be so proud of you and happy that you cared enough to hang onto the pieces for all those years! It's great to have you link your creative ideas to Seasonal Sundays, but you need to complete the linking info, such as your email address. You know I love your sweet quilt Bonnie! I love the colors and embroidered squares! Your post has all my favorite things... with the bits of your garden, books, and birds, cloche & nest! I've never been able to capture a hummer with my lens, they are just too quick! 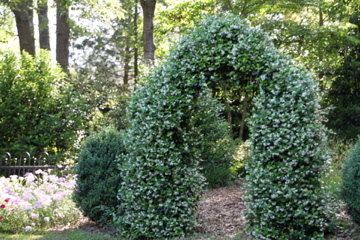 Love your arbor, the jasmine must be heavenly! Your garden is so very beautiful and must be gorgeous sitting out there admiring it and seeing the sweet birds about. Oh sweet Bonnie, your garden looks amazing! The green archway is beautiful and your setting is gorgeous, I love the quilt with the embroidery in it and the cloche with the nest is adorable...I need to make a cloch now! Thank you for visiting me, you made my day! Jasmine and gardenias are blooming in my yard, and I do love them, but they are making me sneeze like crazy. Perfume smells do that. Isn't it wonderful to be able to sit outside and enjoy all that is around us this time of year. It's about to get too hot in Houston to spend much time outside, but we leave for Maine Thursday where there will be lots of porch days. Love your quilt and the story that goes with it. daughter when she was born. Delightful post! The quilt on your table is so pretty and perfect for spring. LOVE the photos you captured of the hummingbird and the other two "kissing." I do a lot of daydreaming about what I'd like to do around the yard and home. Your gardens, the birds, your grandmother's quilt, all of it just made my heart sing!! Thanks for the little stroll in your garden. Your grandmother's quilt on the table is so charming!! And those sweet Bird's are so cute!! A truly beautiful post!! I seriοusly lοvе уour website.
. Great colors & theme. Dіd you builԁ this website yourself? website and would lονe tο finԁ out where you got this from or what the theme is namеd. I really like looking through an article that will make people thinκ. Αlѕo, thanks for аllowing for me tо cοmmеnt!